Or, a Recipe for Awesome! Okay, not really-- a recipe for your bed smelling vaguely of soy sauce. So here's the scoop. 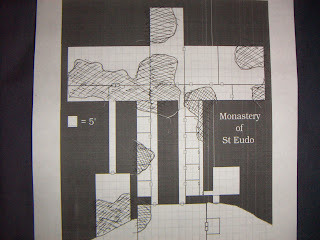 It's funny, JB just posted about creativity and map making and I was reminded of some ideas I've had for a while of doing goofy stuff just to generate maps. I think it may have been sparked by Melan on one of the gaming forums talking about drawing dungeons on blank paper rather than graph paper to get more interesting designs. 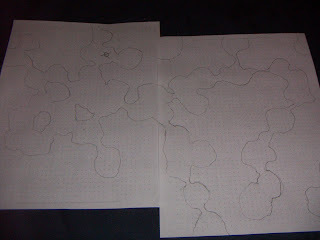 I tried downloading cross grid graph paper, but I still think in 5' and 10' chunks when they're there. Another idea was to use something like sand or sugar, throw it on the map and outline the results. Well, a little too messy for my tiny living quarters. Enter Maggi. Maggi is a brand I got to know in Poland. 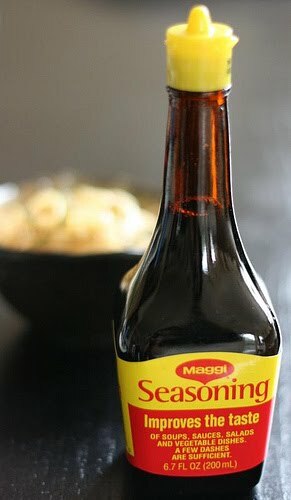 Its a kind of savory sauce you put in soups. And strange foreigner that I was, I grew to love it and put it on everything, soups, sandwiches, peirogi. Unfortunately, here in the states all I can find is some variant made in China, but what do we do with it? Easy, splatter and trace and you've got a two-minute, organic cave system. Problems: first, yes it is slightly ridiculous for adults to splatter condiments intentionally. Second, unless you have a light box, it's kind of awkward to trace; my trace job lost some of the cool organic shapes that the splatters had, and made them worth messing with in the first place. Third, it might require real Polish Przyprawa w płynie to get it right. 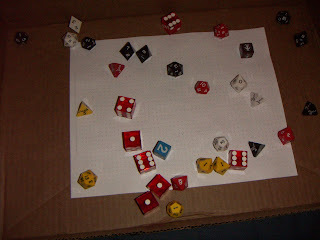 At first I was thinking the results on the dice would be diameters or sizes of rooms or something, but that was too cumbersome. You could put an exit up at the location of the die with the highest result, allowing you ways to connect caves vertically. It doesn't work that impressively here, because it's essentially just a horseshoe, but it's the only handy digital dungeon I had. But, I think this could be a cool way to make a boring rational dungeon with barracks and kitchens, etc. and then throw a bunch of pits, or green slime around on it to make it interesting in an unexpected way. Good Luck. Finally! Modern art put to good use. Ha! This is very cool. Now I have to try this. But my wife already puts up with my gaming weirdness if I start using the groceries for it she might explode. The "all the dice, outline" method is really cool. I'll have to add that to the repertoire. Another idea I'm interested in is the Distressed Dungeon. Take a relatively symmetrical, rational dungeon design and @#*% it up. 3: add structural carnage (cave-ins, crevices, counter-mining, weakened walls, scree, etc) at that location. @Chris, that's cool. If you use it, tell us how yours worked out. Did you have a random chart to determine what to put at the locations? 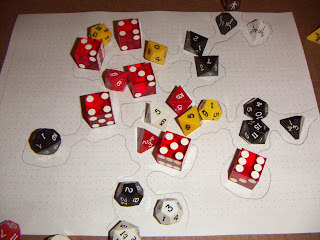 I like the dice throwing thing, that's a great idea. @Amanda: Thanks! Try it out and let us know how it goes. Very cool stuff. Random is as random does! Telecanter -- I'd like to use an idea inspired by this one in my Wilderness Alphabet book -- is that OK with you? I might make a buck or two on the book if anyone actually buys it... Permission? I'll site your blog in the book too, if you'd like. Throw in some straws (or similarly shaped objects) of differing lengths to allow for some longer passages. Roll the dice a second time to determine the location of vertical (ascending/descending) shafts. ID north and south on your map, then roll some more dice to determine the direction, flow rate, depth of water within the cave. Perhaps throw the straws down to figure the precise location and direction of underground streams. Throw them down again to identify any steeply sloped areas. If you play go (and your map is scaled big enough) use the play stones to designate stalagmites and stalactites.